Sumana D Kittur, a young woman journalist, broke all barriers in Kannada cinema by directing a male-oriented subject Slum Bala for her debut. Her next film Kallara Santhe, a political satire, won her the best director award from the Government of Karnataka besides winning for the film's cameraman Sundaranath Suvarna the best cinematographer award. Now, Sumana Kittur's latest directorial venture Edegarike (daring) -- based on reformed don Agni Sridhar's short story of the same name -- releases this Friday, November 23, across Karnataka. The short story gives a first person account of the actual goings-on in the underworld, which has been adapted to the film. The film stars Aditya, Atul Kulkarni, Akanksha, Dharma, Sharath Lohitaswa and Srujan Lokesh among others. In this interview, Sumana Kittur tells Srikanth Srinivasa what it took for her to make a film on the underworld. 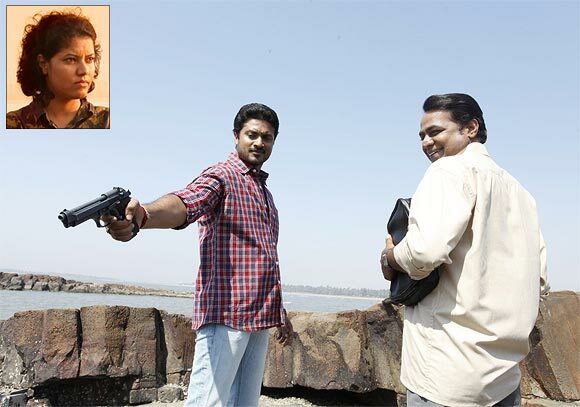 The film is about cult figures in the Karnataka underworld like Sridhar, Muthappa Rai and Bachchan. There is some curiosity even to this day among the people about the manner in which they led their lives and about their underworld activities. These subjects continue to rule the roost on the big screen even today. There were actors who were interested in such subjects before and they are continuing to be so and will continue in future as well. When it comes to a reality check, there is still curiosity about how they are continuing to lead their lives. What do you mean by a reality check? For instance, Sridhar came out in the open and expressed himself in the form of writings for books, magazines and films. However, there is still a lot of curiosity among the people about the happenings in the underworld. I was attracted to some of the complex situations that were part of these happenings be it Slum Bala or now Edegarike. Is Edegarike based on Sridhar's book? Yes. It is a short story written by him actually running into about 70 pages. The author has not made any direct references to the real characters in the story due to unexpected complications. But in the movie, all the characters have been given lives with their real names. Yes. If they were not real-life characters like we have seen in other movies, I could have given them some other names. The film is based on real-life incidents and what more can we ask when a man who has seen it all has come out with a first person account of the happenings? I did not face any problems due to the use of real names for my real-life characters. I have not specified the period but I have tried my best to visit the locations where the crime took place. I think it is a record of sorts. A person who was involved in the underworld has himself written a story and is himself involved in the filming process. Who is the protagonist in the film? Sona played by Aditya, who is a sharp shooter from Mumbai. The film is about how he joins the Bangalore underworld and gets killed. Who is the daring or the audacious person? Sona is the audacious person who is willing to give up his life and get killed. The story takes a turn when he falls in love with a girl and he begins to feel that the whole underworld struggle is worthless. There is a message for people who are aspiring to become 'in'famous in the underworld. How colourfully have you portrayed this character of Sona? Will the film glorify crime? You will see it for yourself. No, this is not a colourful portrayal of the underworld. It is a realistic account of all the happenings. The film is not meant to glorify crime for I have refrained from showing any kind of weapons used to kill. Underworld activities are nowadays much more sophisticated than what our films have been showing. All the crime scenes are suggestively shown with all the impact it deserves to get without showing otherwise. Does such a film need to have song and dance sequences? No. I have used only one song that is not the regular song and dance sequence. I feel we don't need to picturise five or six songs in our movies. I feel it's enough if we have just three songs that go well with the narrative because we have seen audiences losing their patience when a song breaks out in a movie hall and people go out. What is the length of the movie? The length of the movie is under two hours. People's tastes and preferences have changed. Audiences are no longer interested in watching a movie for two-and-a-half hours or three hours because lifestyles have changed. People are always living in tension as they are found with their mobile phones in their hands and are most of the time talking. The length of English films is 90 minutes even if they enjoy bigger budgets and have a wider reach around the world. We should begin to experiment with the Hollywood format. Being a woman, how difficult is it for you to direct such a male-oriented subject for a movie? I am more comfortable talking to the guys than girls. I grew up with my father until he passed away. As soon as I landed in Bangalore, I began to work with Sridhar who is today a father figure to me. People who have been in the underworld are extremely respectful to the women than the ordinary people. When directors like Puttanna Kanagal could make women-centric films, why can't I present my perspective of a man's activity in the underworld? I have enjoyed total freedom working on such subjects and I know for sure when I direct for another producer it will be different. Do married actresses score at the box office? Find out!